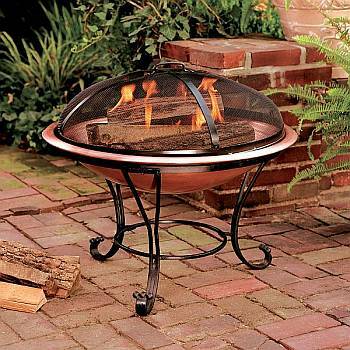 The Arctic Patio Pit is a unique portable outdoor fireplace by Arctic Products. It is great for camping or Backyard parties. Warm your bones on a cool night with a Patio Pit outdoor fireplace. Its attractive copper finish provides elegance and warmth to any patio or backyard for outdoor entertaining with a touch of class. It's attractive, portable, easy to clean and simple to use and extinguish. High quality components make the Patio Pit impervious to the elements. The Patio Pit will burn wood or pressed wood logs. Bowl is constructed of durable copper. Base is constructed of heavy duty cast iron. Assembles and disassembles quickly and easily. Includes hooked-poker for removing hot screens. Keep your fire safely controlled.